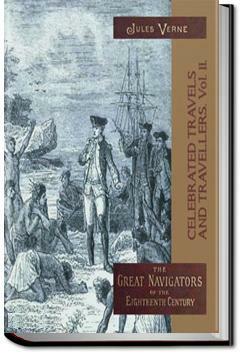 This volume, entitled "The Great Navigators of the 18th century", forms the second of three volumes under the general title of "Celebrated Travels and Travellers". The first volume of the series, "Exploration of the World", covers a period in the world's history extending from B.C. 505, to the close of the 17th century, and the third volume gives an account of "The Great Explorers and Travellers of the 19th Century"
. . .Tahitians bade us farewell, with so much sorrow, and in so touching a manner, that I felt heavy-hearted, and my eyes filled with tears." The uncourteous reception of the English, and the repeated attempts made by the natives to seize the vessel, would hardly have led to the idea of a painful separation! However, as the proverb has it, All's well that ends well! Of Wallis' observations of the manners and customs of the island, we shall only enumerate the few following, as we shall have occasion to return to them again in relating the voyages undertaken by Bougainville and Cook.